PCC motorcycle courses are offered in cooperation with Team Oregon, a nationally recognized leader in motorcycle rider safety and skills training. Team Oregon offers something for riders of every level, ability and experience that will help you ride safer, smarter and more skillfully. For class schedules or to register for a class please visit the Team Oregon website or phone them at 1-800-545-9944, extension 0. All motorcycle riders are required to have a valid motorcycle endorsement on their license in the state of Oregon. The 2009 Oregon Legislature passed a law that requires all new motorcycle riders to complete an approved motorcycle safety training course to get their endorsement. PCC motorcycle rider training courses are offered in partnership with Team Oregon, a nationally recognized leader in motorcycle rider safety and skills training. Team Oregon began in 1984 as a cooperative endeavor between the Oregon Department of Transportation and Oregon State University. PCC partners with Team Oregon to offer rider skills training for motorcyclists of all ability levels and experience to help you ride safer, smarter and more skillfully. TO REGISTER for a course, course schedules and for more detailed information visit the Team Oregon website or phone them at 1-800-545-9944, x 0. TO CANCEL OR DROP a course students must formally drop their course at least three days prior to the course start date. To drop a course contact Team Oregon on the Team Oregon website or phone them at 1-800-545-9944, x 0. The BRT is a great beginning class for new riders and the required training for those under 21 years of age. It is a 15-hour course which includes six hours of classroom instruction and nine hours of on-cycle riding experience. (Motorcycles and helmets are provided.) It begins with the basics, such as turning, shifting and braking, then moves on to more advanced street riding skills and emergency maneuvers. In order to receive your course completion card, you must attend all classroom and range sessions and pass a knowledge and a skills test. If you are under 18, a parent or legal guardian must sign the required waiver form before the first class. If you are under 21, the State of Oregon requires you to take and successfully pass the BRT in order to obtain your endorsement. Students must possess either a valid Driver’s License or Instruction Permit for operation of a motor vehicle and the ability to sustain moderate physical activity. Out-of-state licenses or permits are accepted by Team Oregon. Riders returning to motorcycling or those who have limited riding experience are encouraged to enroll in the 8-hour IRT. This one-day training program builds fundamental street riding skills and strategies. 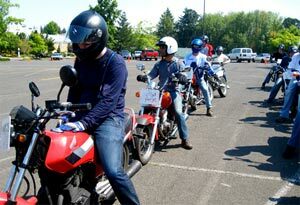 Students can ride their own motorcycles or use one of Team Oregon’s training bikes. In order to receive your course completion card, you must attend all classroom and range sessions and pass a skills test. DMV will waive skills testing for IRT graduates seeking their motorcycle endorsement. IRT graduates will be required to take the knowledge test at DMV in order to obtain their endorsement. Taking the knowledge test at the DMV is not required prior to attending the IRT. Students must be age 21 or older. Students must possess either a valid Driver License or Instruction Permit for operation of a motor vehicle. The RSP is a half day practice session designed for riders with at least 3,000 miles of current, on-street riding experience. This course is for students looking to sharpen their cornering, braking and emergency maneuvering skills under the helpful eye of a professional rider training coach. Whether you are new to motorcycling or have been riding for years, Rider Skills Practice will take your skills to the next level. Spend just one day with a professional riding coach and get more out of your riding! Completion cards are awarded.